How do you style your favorite graphic tee? As a woman that wears a graphic tee almost every other day, I am always looking for different ways to style them. Sure most think of graphic tees as a dressed down article of clothing, but you would be surprised by how many ways they can be dressed up. Today I would like to share with you one of my favorite ways to style my "In a Beautiful World" graphic tee--the dressed-up diva way. You guys probably know by now how much I love leopard print. I rock it as a neutral as much as I possibly can. And since I feel that a blazer is a nice way to take a graphic tee from regular to chic, why not make it a leopard print one like this? You could also rock your ultra soft black jeans with stylish black pumps to complete the look. These fabulous studded Steve Madden pumps would take this outfit all the way to a ten! For the finishing touches, add your favorite red lipstick, simple but elegant accessories, and you have the perfect look. 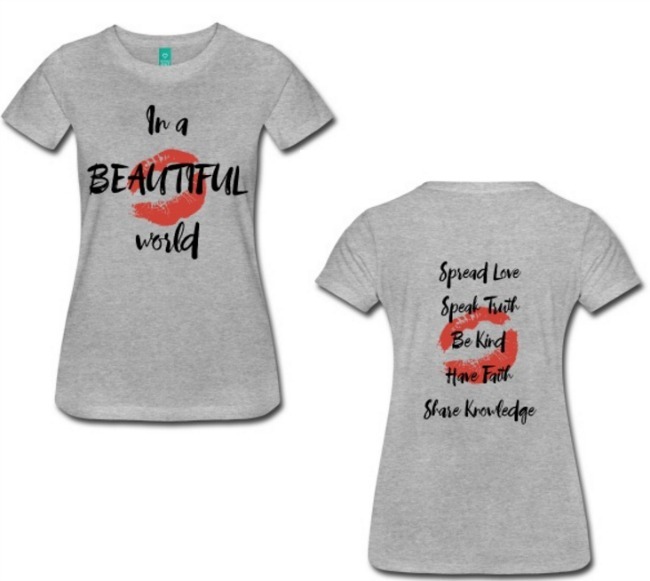 And if you would like to purchase your own "In a Beautiful World" Tee, be sure to stop by my Spreadshirt shop now and get you one!